Attention SF Bay Area developers, building owners, and other parties to building demolition – there are new requirements to sample for PCBs (polychlorinated biphenyls) prior to building demolition. The requirements apply to whole building demolition of commercial, multi-family residential, public, institutional, and industrial structures constructed or remodeled between 1950 and 1980 in the Counties of Alameda, Contra Costa, San Mateo, and Santa Clara and the Cities of Fairfield-Suisun and Vallejo. Single-family homes and wood-frame structures are exempt. For more information see this factsheet and this PowerPoint presentation. Ready to DEMOLISH a Building? For Safety’s Sake, Take Out Hazardous Wastes First! Here Is Where to Start. Download the demolition tutorial PowerPoint presentation here. Before you start, find, remove, and safely dispose of all hazardous materials in the building. Prior to demolition, ALWAYS inspect a structure for hazardous materials. A trained professional should inspect any pre-1980s structure (including residential), as well as medical, dental, veterinary, laboratory, vehicle service, industrial buildings, and other buildings where occupants may have left behind hazardous materials. Segregate hazardous wastes from other construction debris. Consider hiring a professional to segregate the waste. 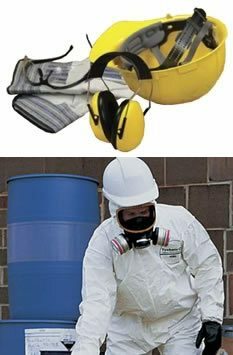 Take precautions, using personal protective equipment and following material-specific guidelines, to protect yourself, building residents, neighbors, and workers from contaminated dust and other potentially harmful releases. Store hazardous wastes in closed containers with proper labeling and secondary containment, if required. Depending on the substance, you may need to dispose of the material in accordance with state and federal hazardous waste disposal laws. If hazardous materials are simply disposed of with other construction debris, they can be released into the environment at the construction site, during transit, or even eventually from the landfill site. Willful or negligent violation of hazardous waste laws can result in civil or criminal penalties. Some wastes may require disposal in a hazardous waste landfill. If the material can be recycled, you can seek a nearby recycling site using the earth911 form on http://baywise.org. Homeowners can use household hazardous waste (HHW) programs to dispose of hazardous waste from their own home. Be sure to call in advance before delivering any hazardous waste to your local HHW facility. These facilities have certain limitations, therefore a homeowner should consult with HHW Program staff regarding the wastes and quantities. The U.S. EPA defines classes of hazardous waste generators and provides a summary of requirements for each class, available here. If the amount of hazardous waste being generated by a contractor or property management firm is 27 liquid gallons or 220 solid pounds or less, it may qualify as “conditionally-exempt”. Contractors and property management firms would then qualify to use Conditionally-Exempt Small Quantity Generator (CESQG) Programs for disposal. CESQG Programs are operated in conjunction with HHW Programs. In general, contractors and property management firms are not allowed to use HHW programs and are required to hire a licensed hazardous waste hauler. A list of California licensed hazardous waste haulers is available here. A list of California licensed hazardous waste landfills is available here. 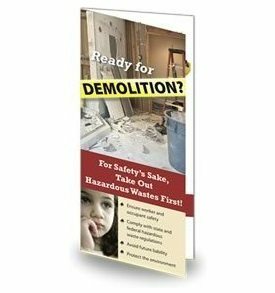 Nothing in this document relieves the person conducting the demolition and property owner from responsibility for compliance with federal, state, and local laws and regulations.